For many years, it seemed cool to make fun of the poor Brussels sprouts. They smelled funny when you cooked them. They usually only showed up at Thanksgiving. And often, they were steamed within an inch of their poor lives. But no more. They can be easy to cook, and work well with a variety of flavors like bacon and apple. Here’s a video on cooking them simply. Did you know that those mighty little sprouts can enhance DNA repair in cells and help block the continued growth of cancer cells. They are best cooked by steaming, roasting, or boiling, and combined with a variety of spices and dressings. They vegetables make a fabulous base for casseroles and salads or work as a satisfying side dish. 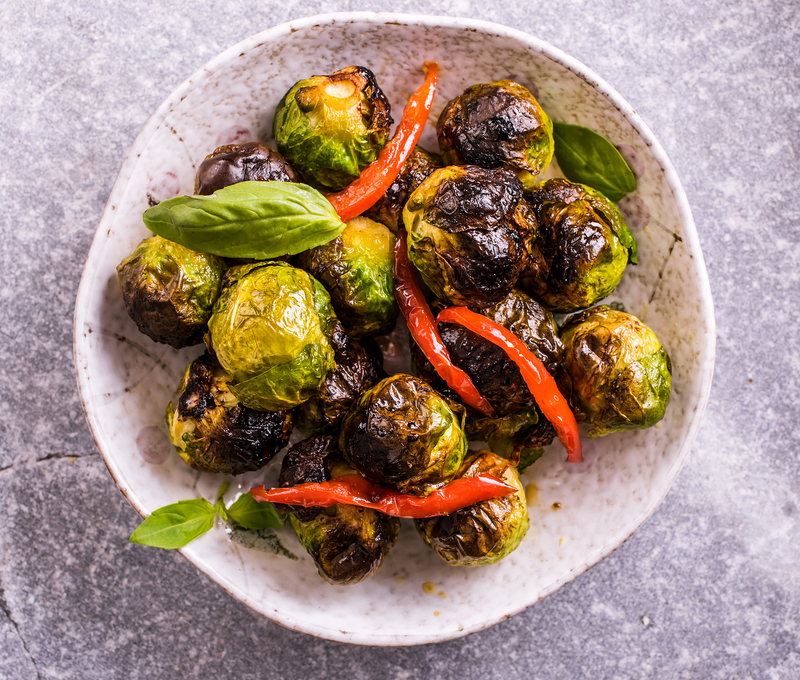 And here are lots of light Brussels sprouts recipes to get you inspired. Hubby and two friends all loved shaved Brussels sprouts salad. It’s not my personal favorite way of preparing them. I’d suggest trying one and see if you like it. The difficulty is getting the sprouts shaved finely enough. But put it in front of my hubby and two friends? It’s gone in a second and they’re asking for more. I love that this uses orecchiette pasta. I think that means “little ears.” It’s a fun shape and gives you a happy experience eating. And instead of bacon slices, you could use pancetta. I have a bunch of Myer lemons right now that would go great with this. There are a few types of chorizo available. I’m more used to the Mexican style than the Portuguese or Spanish style. Chorizo is spicy so go carefuly with additional seasoning. That doesn’t mean it’s hot. I found that out once when I was in a Caribbean restaurant and wanted Cajun style spicing. I was young and didn’t know there were vast differences. Anyway, seasoning matters. Taste as you go and find what you enjoy. I have braised sprouts before and didn’t like it. But I think it was my recipe. I want to continue trying braised veggies. This could be good with plain cabbage as well. Or I may be fooling myself and will never actually like them and always prefer roasted or grilled or steamed. The thing is you should try and get comfortable with different methods. You don’t have to like it. Just go on to the next method and find the way you do enjoy them. This is a whole meal. I love that it calls for whole-grain Dijon mustard which has a nuttier flavor to me. You can also add in 1 tablespoon of light cream to add a little bit of lovely luxurious flavor into a sauce without adding a lot of calories. I like the mouth-feel of a finished sauce that seems to be creamy. In this Craftsy course Love Your Vegetables (w/ Anna Bullett), AnnBullett said that overcooking vegetables can take you past the sharp flavor and into a sweeter, more mellow flavor. When I overroasted Brussels sprouts the other night, they were very soft, and very sweet. So are you ready to try preparing them?